Peace is a precious yet elusive commodity. And it would be even more so if it weren’t for the critical work of interpreters on mission across the globe. These courageous men and women were the focus of a photo exhibit sponsored by the Permanent Missions of Azerbaijan, Belarus and Turkmenistan to the United Nations to celebrate the second UN International Translation Day. H.E. Valentin Rybakov, Permanent Representative of Belarus to the UN, delivered the inaugural remarks. 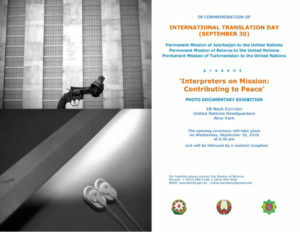 Other featured speakers included representatives of the various missions; Ms. Cecilia Elizalde, director of the UN Documentation Division; Dr. Humphrey Tonkin, chair of the board of the Center for Research and Documentation on World Language Problems; as well as Dr. Maya Hess of Red T.
Red T founder, Maya Hess, addresses the audience at the opening ceremony of UN International Translation Day 2018.